The 3 "private" gifts should be considered in context of Marcello's political and official function for the Venetian state (Marcello is considered to have been a "possible" Venetian doge). 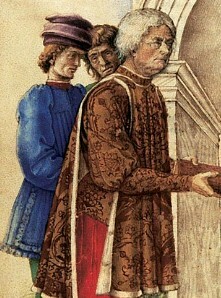 Marcello tried to establish a positive link to the influential René, who still had aspirations on the throne of Naples. 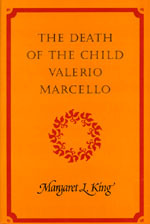 The author Margaret L. King thinks, that a 4th gift was in preparation: a literary collection of consolation letters for Marcello's own son Valerio, who died at the begin of 1461 in the age of 8-9 years. Although Marcello had many children, this boy seems to have gotten his special attention: when the boy died, Marcello transformed his grief into a complex literary project around this tragic event with the involvement of leading humanists of the time, aiming at the production of a luxury codex. The project was finished incomplete with an interruption by a new Venetian-Osmanic war in 1463 and Marcello's own death in 1464. However, the collection of letters survived in a codex "preserved in the University Library of Glasgow". One of the contributing texts contains a short note about activities with Trionfi cards on the side of the boy, it seems, as if Valerio Marcello used to play the game Trionfi with his father's friends. The original text was created by the poet Perleone, a pupil of the Milanese scholar Filelfo, in his "Laudatio in Valerium eiius filium eximium) ("in praise of his" [Jacopo Antonio Marcello] "remarkable son Valerio") after Valerio had died (according King at 1st of January 1461) and before Perleone died himself (at least in 1463), probably around the 1st of September 1461 (as indicated by the author himself - source). The rather long text of Perleone (52 pages) text wasn't completed, 3/5 of the text referred to details of Valerio's life, whom the author likely knew by personal experience. The actual playing activities naturally should taken place earlier than 1461, possibly ca. 1458 - 1460.